Painted ceramic benches representing all the provinces in Spain are arranged round the square. 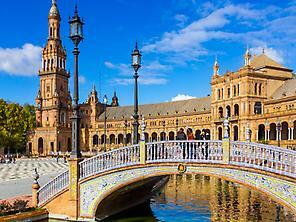 It was built because of the Ibero-american Exhibition of 1929, held in Seville. Its creator was Aníbal González. He mixed a style inspired by the Renaissance with typical elements from the city: exposed brick, ceramics and wrought iron (worked by Domingo Prida). Its floor plan is semicircular. It is dominated by 2 towers, one on each side of the enclosed area, which frame the central building where the main rooms are. Between the two towers runs a network of galleries with an arcade of semicircular arches leading to exits in different parts of the square, where a fountain stands.